Maintaining a contact base is one of the most popular features of Microsoft Outlook. Over time, the number of contacts grows; many become obsolete and are not used in email correspondence. Removing or moving unneeded contacts to the archive will free up space in your mailbox, speed up and simplify the search, and make work with contacts more productive. Finding unused contacts manually is a complex and time-consuming task. Our utility will do it for you - quickly, easily, and safely. - Looks for unused contacts from multiple Outlook folders at once. - Searches for contacts in email messages, calendars, tasks, and other Outlook items for a specific period. - Safely moves unused contacts to the specified folder, allowing you to restore them later. - Can search for contact email addresses among recipients and senders and in the text of Outlook items. - Works with any Outlook mailboxes, PST data files, and Exchange Server shared and public folders. - Provides a convenient launcher application, Outlook add-in, and a command line to run from your scripts and the Windows Task Scheduler. 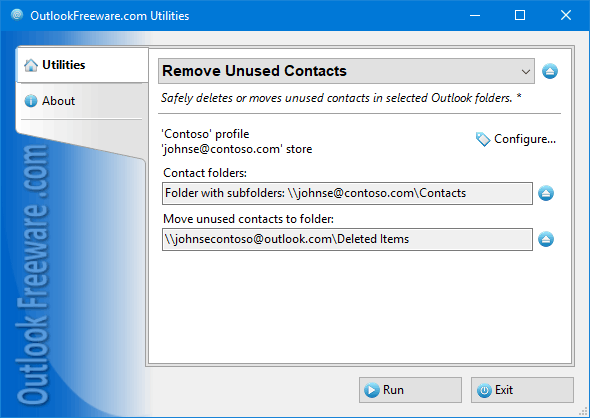 The free utility will search for contacts whose email addresses are not used in messages or other items in the selected Outlook folders. You can also search for addresses in senders, recipients, and body texts for a specified date period. Contacts with unused email addresses will be moved to the specified folder. This is safe because you can restore deleted contacts to their original folders at any time. Contacts in Outlook will become more usable and easier to work with. We provide utilities for any needs. If you do not want to delete unused contacts, you can view their list, mark them with a flag, or assign them the categories you want by using our utilities.